Back-Up Story: "History of the Multiverse - Chapter Ten"
Jason Tood, Donna Troy, The Atom, and the Monitor called "Bob" are confronted by a neanderthalic-looking band of warriors. The head ape claims his people take great offence to those who travel with a man garbed in the Atom's costume. When Jason draws his dagger, the tribe attacks. Mary Marvel takes in one of Zatanna's shows aboard a cruise ship in the hopes that she can offer her guidance on her new abilities. When a drunk spectator makes a perverted remark, Mary's thoughts turn dark as the skies outside. She abandons her plans to get rid of him, but not before Zatanna notices the change in her friend. After finishing a workout, Holly Robinson overhears Harleen Quinzel turn away a single mother for help, instead referring her to the County Shelter because her problems were too long-term. Holly questions her on this and she tells her to talk to Athena. Holly intends to. Upon watching his legion of parademons march below his palace, Darkseid's non-responsive to Desaad's yearning of his approval. Even his concubine at his side notices a melancholy sweep over the overlord. Fearful of the consequences of pressing the matter further, Desaad takes his leave. Darkseid laments that he regrets that the loyalty and discipline exhibited by his parademons will never be shared by his sons. The concubine is taken by her lord's moment of tenderness. Knowing his hordes would feel the same, Darkseid uses his unibeams on the concubine, incinerating her. Darkseid then orders Desaad to remove the vocal chords of his next concubine. All of this is witnessed by a masked spy of New Genesis, who narrowly escapes capture. Jason Todd gains the advantage in the fight, holding the leader of this tribe at knifepoint demanding information on the whereabouts of Ray Palmer. Impressed at the ruthlessness of one from Ray Palmer's world, the ape calls off the attack. He explains that Palmer did pass through here and the torment he had endured back on Earth was written on his face, although he wouldn't go into details. Seeking solace, Ray was instructed to seek powerful magicks in order to achieve that goal. "Bob" inquires the exact location and the leader explains there's a realm beyond known existence. At the Iceberg Lounge, fugitives Trickster and the Piper try to barter the Penguin for sanctuary from the law. Cobblepot refuses due to the fact that where the League go, Batman's not far behind. After consistent begging on the part of the Piper, the Penguin allows them one night of hiding out in the wine cellar. However, unbeknownst to both parties, Oracle has patched into the security camera in the cellar, and relayed their position to Renee Montoya, the new Question. Back-Up Story: "History of the Multiverse - Chapter Six"
The deliberation on what to do with the anomalies in the multiverse continues, this time chronicling the events after the Infinite Crisis, such as the 52 different universes and the creation of New Earth. There is now an Earth where society has yet to leave the Industrial Revolution; another has Superman be a representative of the Soviet Empire; and another is plagued with supernatural phenomena. The brother of the Monitor leading the pro-manhunt argument points out that not all multiverses can be protected; to do so would risk "Chronal Chaos". The brother also chastises how the Monitor handled the Duela Dent affair. None are phased, and the Monitor further points out that if these anomalies are not dealt with soon, another Crisis may be on the horizon. Main Story - 4: To start off with, I want to apologize for the lateness of this review and to plead to Steve to call off whatever hounds he's set loose with my scent. Just kidding about the latter half, but I promise my punctuality will be more on target next time. Now on to business. I really think that this book is hitting its stride in terms of balancing out the main stories. Thus far particular stories like Mary's search for direction or the mystery behind Jimmy's powers have taken prominence. In this issue, each plot is given equal amount of time, with the exception of the Palmerverse brawl between New Earth's heroes and the ape people. Speaking of which if these creatures are already established in the DC-Verse, I apologize that I didn't get a name of their species. Jason's new "wild card" personna has made him something of an answer to Marvel's Wolverine. Also I'm glad to see Renee Montoya take on crime as The Question, which only strengthens the connection between Countdown and the preceding 52. Dini really is an amazing choice of writer for this book, especially when he takes a goody-good like Mary Marvel and gives her a darker edge that seems to be manifesting even more with every issue. This also gives us insight into the soul of Teth-Adam; perhaps he's right in assuming the powers are a curse, since the godly powers he passed on to Mary Batson are different in their origin than her previous abilities. As for Jimmy, putting him in the Gee-Lois-Sorry-I'm-Late moments Clark found himself in during his early days as Superman really shows the evolution of this character from Superman's Pal to a possible superhero in his own right... albeit a very lame name. Speaking of which, since he was already tagged with that name when he was a TV reporter, does this mean that post-Crisis that event never happened? Hope there's some clarification on this one. All in all the writing is great and the characters are really getting rounded out. I hope to find out more about Harley Quinn's new leaf and if it's not just a passing phase for that nutjob, Paul's favorite Bat-character I might add. Nuff said. Main Art - 5: Usually I berate Keith Giffen's breakdowns, but this time the shots were good partially because of good artists. What makes a breakdown artist's composition works is the choice of penciller and inker, and in this issue it was a perfect three-way marriage. Manuel Garcia's designs on such female leads as Holly, Donna, and Renee were on target. They were strong, intelligent, vulnerable, and intuitive. However, the only complaint I have is Garcia's version of Jason Todd and Jimmy Olsen. In some shots, Todd's mask makes him look too much like the Trickster, and Olsen looks 40 years old in that last shot of him grinning when he should be about 20. I notice in the Apokalips scene the parademons look less-gruesome in appearance for some reason. Other than those complaints the overall look of the story was great. Back-up Story - 4: I think this chapter is an improvement from last issue because the roles of these different Monitors in attendance are revealed, as each are assigned to "monitor" particular multiverses. Not only that but it reminds the reader the point of 52 was really the rebirth of 52 multiverses. 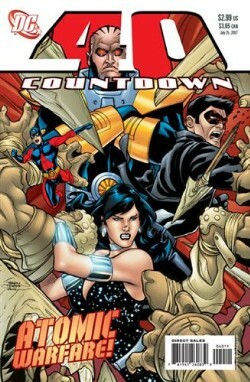 Not only that, but Dan Jurgens has expanded beyond the DC miniseries and jumped into Elseworlds territory, such as the supernatural Batman story and the SUPERMAN:RED SON plot, and maintained that these worlds actually now exist and leaves open the possibilities of DC writers and artists revisiting these worlds. My one regret is that Dan's out of flashbacks to put his special touch on. Back-up Art - 5: One word: Awesome. The money shot has got to be Jurgens' take on the multiple versions of Superman on the last page, however the color of Kingdom Come Superman is a little off. That's another point that I should've made about the writing; since that particular version is going to become a member of the JSA, the possible future angle of Kingdom Come has now become a multiverse. Keep it up Dan and we'll keep reading. Cover Art - 4: One word: BRAWL!!!! Its composition reflects on the fact that this particular plotline is covered twice in this issue. In short it makes sense and it's a great visual.